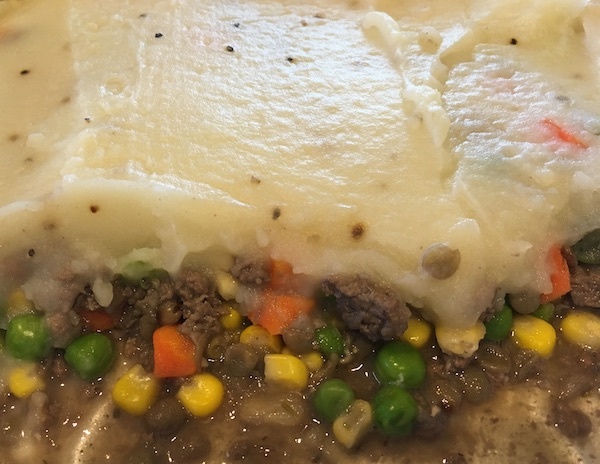 Shepherd’s Pie is on this year’s short list of freezer meals, compliments of Anne. I didn’t eat it growing up or fix it for my kids, but she tasted it somewhere and has been perfecting the recipe ever since. It makes a good, hearty dish with plenty of veggies and makes a complete meal. It’s naturally gluten and dairy-free and can easily be made dairy-free. So Shepherd’s pie for supper means everybody in our family can eat from the same pan. Win-win-win! To prepare the potatoes, add egg and butter to cooked potatoes and mash well. Add milk a quarter cup at a time until the potatoes are the consistency you like. Spread on top of casserole. Bake in oven on 400 for 20 to 30 minutes.